Withers had an analytical mind, a great personality, and a superb sense of humour - not to mention the technical skills of a Da Vinci. Edward Withers was born in Wellington, New Zealand. After studying at Wellington College, he enrolled at the Royal Academy in London and later at the South Kensington School of Art and the Slade School of Art. Eager for more training, Withers moved to Paris and the prestigious Académie Julian, During World War One, he saw service in Samoa, Egypt, France, and Germany and received three decorations. In 1924, Withers came to America with his wife and two children. In his Hollywood years, he did a number of celebrity portraits while employed in a series of jobs, including art director at MGM Studios, supervisor in the trick and miniature department at Universal Studios, art director for Earnshaw-Young Advertising Agency, and art director for the Sterling Press Lithograph Company. He also painted fine-art works for his own enjoyment, and his award-winning landscapes were widely exhibited. 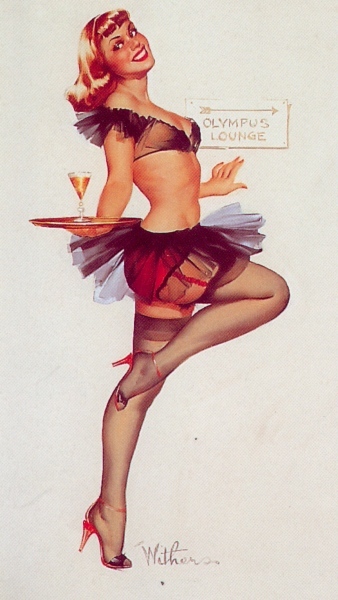 In November 1950, at his first Brown & Bigelow cocktail party, Withers was talking with Norman Rockwell when Rolf Armstrong and Gil Elvgren arrived. 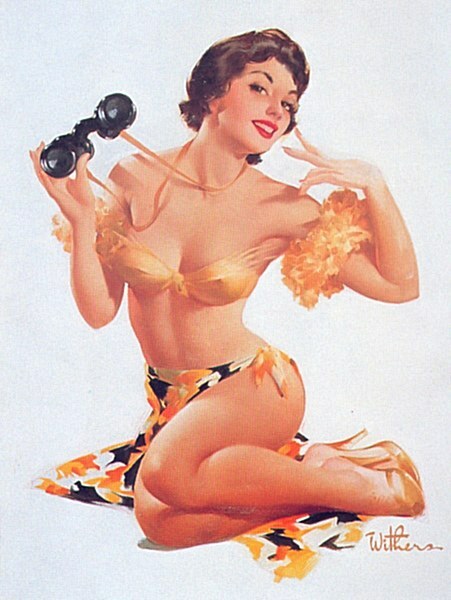 These two pin-up greats were introduced to Withers, who was bowled over when Armstrong praised him as "one of America's greatest, most versatile painters" and Elvgren, who had a keen interest in photography, added "one of the best photographers in the country". In a letter to Brown & Bigelow, he once described the view from his Hollywood apartment in this way: "At night I look out on a carpet of jewels composed of neon and street lights, and here I work and am grateful that way over the eastern horizon, you nice people multiply my effort and enable me to live very well indeed". Ted Withers biography borrowed from The Great American Pin-Up by Charles G Martignette & Louis K Meisel. 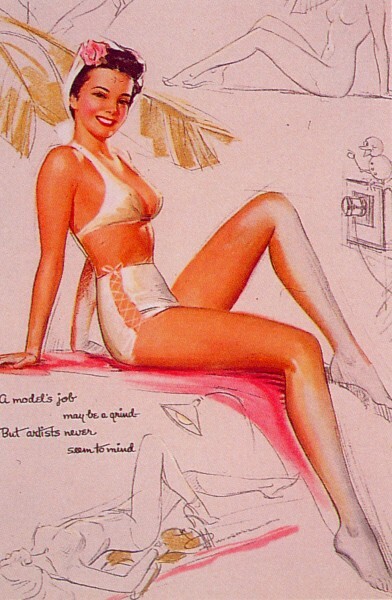 All Pin-up Files gallery images are subject to copyright and must not be considered to be in the public domain. All copyright information is shown where known. The Pin-up Files is copyright © 2001-2018. All rights reserved.